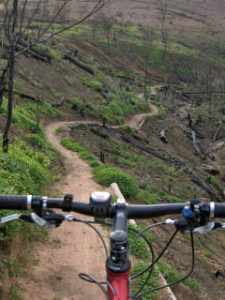 Dirtopia and mountain bike trails are basically synonyms for anyone mountain biking in the Cape Winelands Western Cape or South Africa for that matter. 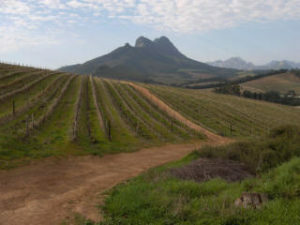 The Dirtopia Delvera MTB trails centre is situated just outside Stellenbosch at Delvera on the R44 between Klapmuts and Stellenbosch. This little piece of singletrack heaven makes you remember what mountain biking is all about. 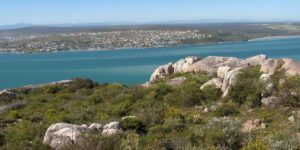 It is in the heart of some of the best mountain biking locations in the Western Cape. 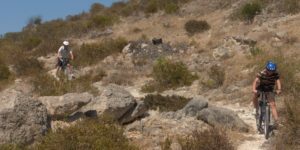 At Delvera there are 3 marked mountain bike trails to choose from, marked as green, red and black. So there is something for everyone, easy rolling farm roads to tight singletrack switchbacks with rocks and little room for error. Delvera was easy to find on the left hand side heading out of Stellenbosh on the R44 towards Klapmuts. The trail centre is part of a little complex of buildings including a restaurant, cheese shop and nursery. At the trail centre you can get your ride permit for R15 and get a snack or some forgotten or last minute mtb items. Owners Meurant and Arina also operate the Dirtopia Trail Lodge on the Delvera property. I booked in there for the night and it was great being right there. For a mountain biking holiday this accommodation is well situated in the Cape Winelands close to Stellenbosch and other mountain bike trail options. I didn’t choose the best day to go riding with a fierce cold front approaching the Cape, but it was a case of now or never so off I went. I decided to ride all of the routes so that I could get a bit of time in the saddle and do a nice comparison. The plan was to go from difficult to easy. The Porcupine trail is 15km and marked as red with a new 3km black loop attached to it. After a couple of kilometres the riding was clearly heading in an upward direction. Winding through the vineyards the route headed for the kop?, that singletrack heaven that I mentioned earlier. As I climbed the tracks whittled out and eventually lead into the start of the singletrack. As was to be expected with legendary “Meurant singletrack” the planning and construction was great, fully rideable, well thought and fun. This red route was indeed red and you needed some good balance skills to make it around the tight hairpin bends and a bit of power to get over the rocks. The black route was a three kilometre loop off the red route heading up the the hill. It was clearly not used as much as the red route and definitely more challenging. The gradient had increased and the climbing was tough on the rocky single track. It was great though with a false crest at the top yielding more views down the other side of the valley. I was glad to reach the top as I was thinking if this gets much harder then I am going to have to start walking, and that’s just no on! But that never happened and soon I was using all of my 4 inches on travel and going easy on the breaks. Descending on singletrack requires absolute focus and concentration as I picked my way down the mountain with kilometres of singletrack snaking in front of me. The black decent was definitely a challenge perfect for adrenalin junkies. 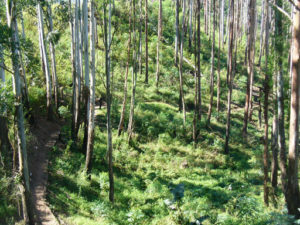 A total of 8km of single track is to be ridden doing the red and black combined. Back onto the red route and it was gradual downhill following the contoured singletrack. Towards the and there were a couple of nice little jumps to get some air off before the track headed into a little wooded ravine with a wooden bridge and then it was down into a little forest section. Popping out of the forest it was back onto the vineyard roads towards the trail centre. On round two I followed only the red route as I wanted to see what I had missed out after taking the black loop. What I got was all the fun sections without the tough black climb and technical decent, it was great fun doing all again. After two loops my legs were starting to feel it, and I was glad that I had left the easiest for last. 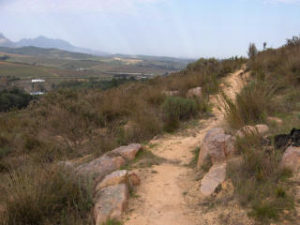 The Vineyard trail is about 7km and is marked as green. It is no walk in the park with some nice little ups and downs to make you work but reward you with a view as well. The really nice part of it was that it was not technical at all and included two pieces of easy single track to give you a taste of what it is like. It was perfect as a lap of honour for me after doing the red and black. In the end I did 32km and it took me just over two and a half hours. Don’t let the short distances deceive you, because the trails are either technical or steep or both. The 32km yielded an ascent of 830m which is tough going. It was awesome mountain biking though, with great trails, climbs, descents and views all around of the Cape Winelands.